RATING: 4.75PROTAGONIST: John RainSETTING: Manila, Thailand, JapanSERIES: #4 of 4The one thing that you must do if you are a paid assassin is to learn how to remove any emotional elements from the act of killing. Each target should be viewed as goal to be accomplished, devoid of any feelings about the person or the deed. Thus, when John Rain is hired by the Israeli intelligence organization "Mossad" to kill Manheim Levi, an Israeli explosives expert, he is amazed to find himself hesitating when Levi's young son comes into the picture. Rain relates to the position of the son after having lost his own father as a youth. But he's not supposed to have these feelings; in fact, what has made him successful in his chosen career is his ability to stage a killing that looks natural and leaves him later with no remorse. His reputation impugned, Rain must complete the assignment both for himself and for the organization for which he is working. Partnering with a flamboyant American by the name of Dox, who helped him out of a bad situation previously, and Delilah, the intelligence agent who referred him to the Mossad, Rain goes on a global chase to meet his objective. Hindered by twinges of conscience, Rain still hasn't lost the skills he has honed over the years. Facing danger, both to himself and his colleagues, he is able to pull out his bag of tricks and dig into the organization that was fronting Levi.KILLING RAIN succeeds on many levels. The plot is complex and fast moving, and the various Asian settings add another dimension to the narrative. It's fun to see the impact of the rambunctious Dox on the very serious Rain; at times, John even lightens up and makes a joke or two. Delilah, the Israeli agent and love interest, is multi-dimensional and unpredictable. The action scenes are superb; the art of spying with all of its paraphernalia is fascinating as well. The only weak area for me was the reintroduction of a previous love interest toward the conclusion of the book, in a scenario that felt improbable at best.But to me, where Eisler really excels is in how he portrays the psychological stresses that Rain is going through as he matures. Certainly, having any hesitancy or doubt about what he is doing is going to end in a very bad result for Rain. But he is finding that he needs to justify his own behavior; and as he does so, the reader becomes involved in Rain's moral dilemma. Yes, Rain is killing people; however, don't they deserve to be killed? By eliminating subversives and terrorists, is not Rain eliminating vast harm to the general public? I fell in love with Rain in the first book in the series, RAIN FALL, and am a big fan of international thrillers. By adding in Rain's struggles with his conscience and his ability to trust his erstwhile partners, I felt that KILLING RAIN had a sense of humanity that is often missing in books of this type. Other readers may see this as a sign of weakness in a strong character; to me, it added another dimension and made the book all the more enjoyable. This was my first introduction to John Rain, assassin for hire. Coming to the series having sidestepped the first three books did leave me exposed to the gaps in my knowledge of his history. There are carry-over characters here from his earlier adventures and knowledge of the back-story would have been advantageous given numerous references in this book. My advice would be, if you are new to this series do the logical thing and start at the first book!In style, it felt like Lee Child’s Reacher series in the transient nature of its hero’s lifestyle and also in his seeming indestructability despite, at times, facing multiple foes. Rain is also somewhat reminiscent of Vince Flynn’s Mitch Rapp, another nailed down killer, in its meticulous attention to the nano detail of tradecraft. But, in some ways Rain does feel different to both. For example, at times in this book he examines his conscience regarding his choice of occupation, something I don’t recall either Reacher or Rapp doing. In fact Rain is altogether more humane, a more considered character. Though in conclusion, the book is close enough to both series for me to assume that if you like one of ‘em you’ll like ‘em all.The plot is complicated enough to keep you guessing and the action scenes are exceptional. It’s pacy, as Rain skips around Asia in a dizzying series of flights punctuated by some ruthless disposal of the bad guys. The characters are well drawn if a little stereotypical. Overall it’s a pretty good read. Is it enough to draw me back to devour the rest of the series? I don’t know, time will tell. There is too much pointless bad language but I managed to enjoy it nevertheless by for the most part overlooking it. John Rain wonders where God is and why he doesn't smite him. There is some more interesting thought along these lines. I hope I can get the next one as I want to find out more about Midori. Love these! And the addition of Dox provides some awesome comic relief. I'm not sure why the titles of the books in this series keep getting changed--it can't help potential readers to keep track of them. As far as I know this is the fourth book in the series and I think I've read all of them.For the life of me I can't figure out why I enjoy these books so much. They are full of cold-blooded violence and the main character is a hit man (or assassin). I suppose it's partly because he does have attacks of conscience at times (but never enough to keep him from killing people). But I think I also enjoy these books for the same reason I enjoy Lee Child's Jack Reacher books: I find it fascinating to see how the main character is going to get out of the situations he gets into without getting killed himself. Of course, John Rain is too good to be true (like Jack Reacher), but since the author explains Rain's thought processes, it makes what he accomplishes more believable. This particular book was also interesting for its settings. I've never been to any of the places in this book, but the descriptions give me a taste of what they're like. I also liked Rain's philosophical ruminations. I enjoyed the facts given and the commentary about just about everything Rain encountered. That was all this story had, there was no foundation. I wonder what Eisler's contract with the publisher was? Clearly this episode was incomplete and not ready to publish on literature parameters.As a reader, when I embrace a series, this is the negative side. I so enjoyed Tom Wood's series with Victor, that I went looking for another to feed my fix/need.I stumbled across Barry Eisler and have read the entire 8-book series. And was very pleased. As such, this is the same review for all 8 books.The author reads his own work, and after listening to Tom Wood's series with Rob Shapiro as the wonderful narrator, this took me a while to adapt to the reading style.But don't let that dissuade you. Barry Eisler does a really really fine job of narrating, and you get to hear the different personalities, and understand who is who pretty quickly.Barry Eisler has a nice knack of leading the reader on, enticing them to continue the story, and understand the predicaments the protagonist (John Rain) finds himself in. In addition, the growth of the character is wonderful. Kudos to Barry Eisler, and his real-life background that leads him to be able to write this well (check out his website as well! ).As I mentioned above, I have read all 8 books. Once I got through book 1, I could not put down the entire series.I liked this series so much, I'd love to meet the author, and can't wait to read more of his works as well. #4 in the John Rain series. APA One Last Kill . John Rain is a half-America, half-Japanese Viet Nam veteran now living in Tokyo as a freelance assassin.John Rain agrees to assassinate an explosives terrorist on behalf of the Mossad, a deal brokered by Delilah. With Dox as his partner, he attempts the hit in Manila but it goes wrong and leaves two dead men identified as CIA agents. The Mossad want Rain removed as a possible link to the hit on a CIA asset. Can Delilah be trusted or will she help target Rain and Dox? Book 4, and free-lance assassin John Rain keeps getting better. Visits to the Phillipines and Bangkok (as well as a return to Hong Kong) highlight the travelogue. I wouldn't recommend this without reading books 1 thru 3 though. It might still be enjoyable, but the backstory and foreshadowing add so much more.Most excellent! Another in the John Rain series. I like how the author is developing the depth of character of Rain. The first book or two he was very much a cold killer, but as new characters are added, the nuance and self-reflection of Rain is adding to this series, making it unique in the assassin/spy thriller genre. A John Rain Novel. An excellent, well written novel. I really enjoyed this book and this authors writing style. John Rain is a contract Hitman who has been hired to take out some very important terrorists. Rain fails and now he is the one who is on a hit list. Betrayal and government corruption abound in this action packed novel. Another solid entry in the John Rain series. Eisler gets kudos for a strong plot and credible characters. Factor in the exotic locales - Manila, Bangkok, Hong Kong and Tokyo - and you have a sophisticated thriller that commands your attention right up to the last page. 3.5 There's something missing here. Maybe too much brooding and rumination and not enough action and fighting scenes. Actually, I like the previous book in this series Rain Storm more than this one and I rated it 3 stars too so I think I should change my rating there. My 1st Barry Eisler/John Rain and I must say I am impressed with the book. Short book, no unnecessary confusing the main plot, straight hitting of the story by the author, meant for a thrilling quick read and delivers to that agenda with a bang!The story picks up from the last book (which I haven't read) where Rain and Dox became partners in their trade and in this book, they were still trying to establish trust between them. Delilah, Rain's adversary and then love interest from the last book recommends Rain to her employers in Mossad and Gill & Boaz from Mossad approach Rain to do a job on a bomb maker expert Manny, who is Israeli by nationality but selling his art and crafts to some very bad people in the middle east. Since Mossad believes that Manny is being run by CIA, Mossad cannot directly kill Manny, hence the detour via John. John & Dox follows the target and just before killing Manny, Rain pulls back as Manny's son was with him and Rain doesn't kill women and children (assassin with a conscience!). But before pulling back, Manny's bodyguard and 2 other bodyguards, who were inconspicuously watching Manny gets killed. After that, everyone starts to clean up the mess that's created. Mossad sends Delilah to lure Rain out to them to kill Rain, so that CIA doesn't know of their involvement. Delilah turns after meeting Rain and together they plot to finish the job, kill Manny so that Rain is not hunted. That being the end plot, the book travels at incredible speed towards the final showdown and the finale is riveting and captivating.I loved the author's writing style, most of the time, the comic sarcasm works well. Moving in between 1-person to third-person style of writing is refreshing as well (not like Lee Child when it becomes very irritating use of I/Me/Myself). The seriousness of Rain with the funny bone of DOX and the beauty quotient of Delilah makes the book a wholesome story and a relaxed easy read, just what I like, without putting too much pressure on the grey cells!Liked this book and would pick up the series as I go. Only frustration is, the author needs to make up his mind for the book titles as each book seems to have had 2-3 different titles in it's retail lifespan!! The fouth of Barry Eisler's excellent John Rain books, Killing Rain (later retitled Redemption Games) finds the assassin in Manilla on a freelance job for the Mossad. No longer a committed loner, Rain is now working with Dox, the former Marine sniper who recently saved his life, and the assignment has been brokered by Delilah, the Israeli agent with whom he shares an ongoing romantic entanglement. The target, Manheim Lavy, is selling bomb-making expertise to terrorist groups, and he represents a new effort by Rain to use his deadly talents in service to a greater good.But while Rain's conscience has guided him to more palatable work, it wreaks havoc when he momentarily freezes in the act of killing Levy. The ensuing chaos sees the target escape while Rain and Dox take out both Levy's bodyguard and two unknown gunmen. The Mossad, looking for deniability in eliminating Levy, is furious when it appears that the latter were CIA and they find themselves entangled in the deaths of two agents of the United States. Meanwhile, Jim Hilger, the Central Intelligence Agency operative Rain encountered on his last assignment, has been working with Levy, and he is deeply unhappy about the attempt on his asset's life. Rain and Dox must now work to convince Delilah to buy them time enough to finish the job while the Mossad sends one of their deadliest after the pair, and Hilger begins ramping up the pressure. 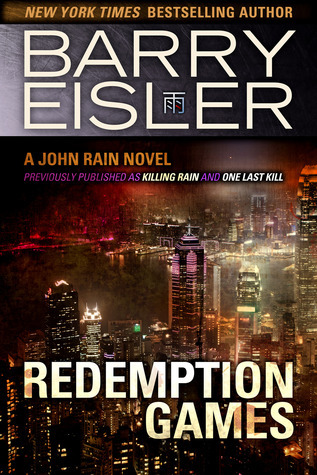 Rain is boxed in like never before, and his new efforts at personal trust may well be his undoing.One of the best things about Eisler's Rain books is that the author continues to develop his character in highly credible ways. Rain is getting older; while his tactics are better than ever, he's not quite as quick as he once was, and now carries a knife - something he would never have done in his younger days. He has let a few people into his life, albeit with great reservation, and has begun to ponder exactly what it means to be John Rain. While he's doing all of that, Eisler spins another fantastic, globe-trotting suspense thriller that brims with smarts, memorable characters, and a plot that is both propulsive and appropriately contemplative. Eisler started strong with his first novel, and has only gotten better. Better. A nice return to the form of earlier books with some interesting changes and additions (Thailand/Hong Kong, Dox/Delilah). The author's personal convictions still seem to bleed through in some of his characters (hatred of bureaucracy/government oversight, obsession with Israel, etc) but overall it seemed a little more toned down. I was ready to put away this series after this book since it's the last one I physically own but I still might come back to it. The ending leaves enough ambiguities and threads that I'm curious where everyone ends up and this book was a pleasant and quick enough read. I've loved the idea of John Rain since I read the first book all those years ago. The characters are intriguing as always. Dox is such a great contrast to Rain's usual persona, he has quickly become one of my favorites in the series, along with Rain's relationship with Delilah, and Midori always in the back of his mind during his quieter thoughts when he is alone. This series just keeps getting better and better with each book! I checked out a few Barry Eisler audiobooks after thoroughly enjoying Livia Lone. Spy mysteries are among my favorite genre; unfortunately the Rain series isn't doing it for me. They're not bad, but seem a bit cliche and repetitive. I can't like Dox. Not sure I like Rain. Pretty sure I won't listen to any more than I have already taken the time to load to my iPod. I like the way the characters are developing. The addition of a partner has changed the style a bit - stopping it from getting same old, same old. John's increasing self doubt is credible and though you can see it will probably eventually lead to redemption I doubt if it will happen any time soon. I feel compelled to finish the series. Recommended by David and it did not disappoint. Impressed with the author's knowledge of the Far East, including food, geography, and language. Will definitely be reading more of the John Rain series. Wow x Rain is great and Dox the perfect partner. Couldn’t put it down! Yay!While I predicted many of the things that would happen (I usually do very well at that), I loved this book! I’m excited to move on to the next! Sooooo GreatThe tale of deception, intrigue, misleading information and activity far exceeds expectations! Romantic liaison and false identity keep this story smoking! Another fast paced, easy reading John Rain story. Awesome as usualI'm hooked on these books! Spy craft and action with great plots and character depth. Give these a try you will not he disappointed. A good solid John Rain story. The mind mixed with action. An appealing hit man struggling with his career choice. Here he's after a bomb maker with his enjoyable partner and an interfering female too gorgeous and deadly for the reader to relate to.